Thank you for considering a gift to the Animal Welfare Program. The Program provides an opportunity for people who care about the well being of animals to support basic and applied research in this critical field. Thanks to our donors, the Program has evolved into a world-renowned centre for animal welfare research. 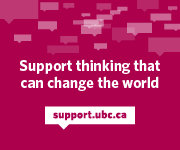 Donate now through UBC’s secure online giving system.